The history of modern sports massage starts with Paavo Nurmi or the “Flying Finn” who won 12 Olympic medals in three consequent games (1920, 1924 and 1928). He was the first athlete who brought professional massage therapist to all of his competitions, and credited massage therapy as a part of his success. Since then, most professional world athletes have been using sports-massage therapy as an integral part of their sports training routine. Undeniably, sports-massage therapy helps them train harder, compete better and rehabilitate faster. However, let us face it; while some massage therapists are involved with professional teams or individual elite athletes, most of us work with regular people who simply want to look and feel better. Despite that the connection between professional athletes and sports-massage therapists is strong, it is not the same with fitness enthusiasts who have not been exposed to sports massage and its potential benefits. Therefore, it is our goal as massage therapists to educate our clients on the importance of implementing massage therapy as a key component of any fitness program. I have observed through my personal experience working with the Russian Olympic Triathlon team that these athletes are like machines – they eat, sleep and train. That is all they do. Of course, they have been paid to do so. They train up to eight hours a day with their training schedule planned around eight to10 major competitions per year. Naturally, they are exposed to an overwhelming amount of stress, which is a major factor leading to injuries that limit an athlete’s performance. Hence, they take massage therapy very seriously as an effective tool in mitigating that compounding stress. As far as quantity, most therapy entails two full-body massages and three to four local massage sessions per week. Needless to say, every team member looks forward to each session! Also,based on my 20 years of experience working with fitness enthusiasts in the United States, I am sure that the science of sports massage has a perfect application in this arena, as well. The reality is that even though people initially come to sports clubs, gyms, etc., to exercise for health, if you observe them in action, you would think they are professional athletes judging by the amount of effort they exert. In other words, they are exercising very hard without realizing the consequences of the pathological changes that are slowly developing in their bodies in response to chronic, physical overload. The bottom line is that fitness enthusiasts need to include regular sports-massage therapy as a logical part of their commitment to both fitness and health. The more frequently and intensively they exercise, the more important it is for sports massage to be included in their fitness routine. Of course, both your clients and yourself would benefit from setting up your massage table or chair at a location in or near a fitness facility as a convenient bridge between loading and unloading skeletal muscles, joints, etc. Furthermore, if you clearly explain the value of those massage applications to your clients, you should have a booming business from people coming to see you for a 30-minute session. Clearly, it is a question of marketing these shorter, but more frequent massage sessions to both your existing and prospective clients as an important part in reaching their fitness goals and objectives sooner. Another key component to successfully building your massage practice in the fitness arena is your mindset. You should approach your clients as if they are professional athletes since the chance for a physical overload and injuries with them is almost equally high! Although they do not spend eight hours a day training, as professional athletes do, but these people tend to overdo it even with smaller physical loads because they are doing too much too soon! Simply, they do not know any better. This is where your role as an educator is important: Explaining the chain of pathological changes within skeletal muscles, making the connection between hypertonically contracted muscles and the cardiovascular system, providing scientific data showing massage therapy as a necessity for fitness-oriented people, etc. Another important factor to consider is the fact that muscles get tight and stiff as a result of peoples’ efforts to get fit. It is almost as if there is a trade-off here. Normally, a person has soft (and not necessarily flabby) muscles. Then that person begins some form of fitness routine, such as working out at a local gym, hiking, yoga classes, etc. As a result, the person feels fitter as those muscles get stronger and more defined after being challenged with the extra physical load. Subjectively, these people are happy to acknowledge they are getting stronger. However, objectively, their muscles are becoming tighter at the same time, which is a path to potential injury. As you know, the tension in the skeletal muscles is under the control of the muscle spindle receptors, which constantly report to the motor cortex about tension and stretch developed in the muscles where they are located. Fig. 1 illustrates the anatomical arrangement of the muscle spindle receptors in the left semitendinosus muscle. Based on the data the motor cortex receives from the muscle spindle and Golgi tendon organ receptors, the brain estimates the muscles’ condition, their ability to perform work and be ready when needed. Let us consider that the fitness enthusiast hires a personal trainer who starts to push the client to his or her physical limit and beyond. The trainer is in an understandable position since he would like to produce results as soon as possible so the client sees a positive dynamic and continues to use his services. This scenario will trigger several pathophysiological mechanisms, which potentially could injure the fitness enthusiast immediately or in the long run. We will discuss here possibility for the long term injuries. As you know, each muscle has a specific anatomical length which may vary from the type of activity we do or as a result of a different stage of our life. As I mentioned before, this anatomical length is partly under the control of the muscle spindle receptors. The personal trainer pushes his client to the maximum and slowly the tension building up in the muscles starts to shorten them. The client begins to feel it as tightness in the muscle but then a new exercise routine is introduced despite the fact that the client has not recovered yet. 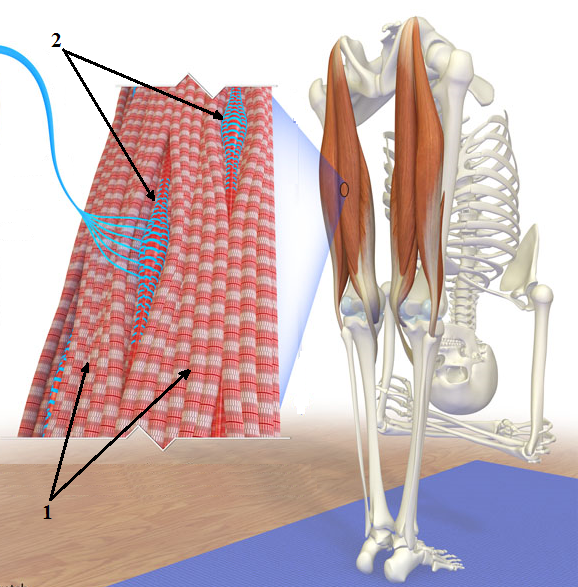 Slowly, the muscle spindle receptors start to adapt to the “new” anatomical length of the now shorter muscle. This process builds very slowly, and the client does not notice since he loses the parts of the affected muscle contractions that are not used frequently (e.g. very end of ROM). As soon as the muscle spindle receptors adapt, they cease to send alert data to the motor cortex and upper motor centers, which in turn allows the trainer to continue pushing forward since the motor cortex considers everything is normal with the degree of muscle tension. At this moment, the client feels that he has improved his exercise routine and is really happy with trainer’s work since he finally sees a positive dynamic. However, this assurance in physical improvement is misleading since the real problems already have begun without the trainer or client’s awareness. Since the muscle spindle receptors have now adapted to the shorter muscle and consider its shorter length normal, they no longer provide the brain with real-time data. In such a case, the motor cortex requires the muscle to perform while now the muscle is shorter, and, as a result, blood supply and drainage suffer. With continued demand to perform, the muscle simply suffocates and, in other words, demand exceeds ability. This situation is a recipe for disaster since, sooner or later, the muscle and fascia may give up, and the client will suffer an injury that could put him out of fitness for months. I expect that some readers will say that I have pushed myself hard for many years and feel great and strong. Yes, this is exactly what we are talking about. If at the top of your successful fitness career, you maintain the original anatomical length of the muscle, you will be greatly surprised how much your performance increases, and how lighter and easier your exercise routine becomes. I see this regularly with my clients who are fanatically dedicated to golf. They are coming to me with shoulder or neck tension and during evaluation I see that their quadratus lumborum and lumbar erectors muscles are extremely tight. These clients never complained to anyone since about lower back pain or tightness because they gradually have lost elasticity in the lower back tissue long ago. After I convinced them to avoid playing golf for a week or two I concentrate on restoring the normal anatomical length of tight lower-back muscles. After I release tension, my clients come back to me in complete shock. They simply cannot believe the improvement in their game since their swing has become more powerful and their golf balls fly much further. Ironically, if a person hires a personal trainer or Pilates instructor, or signs up for a series of yoga sessions, etc., then he or she reaches the point of physical overload even faster if there is no system of tension relief previously established. Thus, people in the fitness arena, as well as their clients, have to be fully aware that there are many ways to become physically overloaded, and there are relatively few ways of reversing or even preventing that process, with sports-massage therapy being one of the major ones. This is where you, as a massage therapist, offer the ultimate solution – regular sports-massage therapy that must be integrated into the training routine! 3. Make a habit of using a sauna/steam room and passively stretching there weekly, on a day-off from athletics. Let us look at the practical application of the sports massage in the cases of two imaginary clients: Client A and Client B. Client A is a 39-year-old female, physically active with a history of tension headaches. Her fitness goal is to lose 20 pounds and to get fit enough to compete a marathon. She burns a lot of calories daily due to her energy-demanding job as a landscape designer and also taking care of two young children at home. Client B is a 46-year-old male, physically inactive, with a history of lower-back pain. His fitness goal is to lose 40 pounds, to strengthen his core and to improve his posture. He burns relatively few calories daily due to his sedentary lifestyle and his desk job as an accountant. Clearly, there is a need for an individually customized weekly routine to be followed in order for both Client A and Client B to reach their fitness goals while maintaining their health and prevent possible overload or injury. Below are examples of these weekly fitness plans with massage therapy serving as an integrative part of training process. Essentially, we are looking at four days per week of training and three days of rest/light maintenance in this instance. Thus, we are planning our massage therapy sessions accordingly – to reflect on both the amount and distribution of this physical load over the week. In this instance, we are looking at six days per week of training and one day of rest. Once again, we are planning our massage therapy sessions accordingly – to reflect on both the amount and distribution of this physical load over the week. At this point, I would like to emphasize the importance of differentiating between stress reduction and sports-massage applications. With sports massage, we do not follow “the one size fits all” approach with a goal of general relaxation. Instead, we must customize each session to determine both intensity and type of techniques to be used based on the time and purpose of massage session – either before (pre-event), after (post-event) or instead (training variation of sports massage) of specific, physical training. Consequently, we – not our clients – should decide on the length of each session: full-body massage, local massage or self-massage. There is another misunderstanding about sports massage that I have observed frequently – the sports-massage term is used to describe the treatment of various sports injuries. This is a completely incorrect perception since sports massage targets healthy athlete or fitness enthusiasts as a preventive and optimization measure. When pain is present, it is too late to use sports massage to fix the pathological condition. In these cases, medical massage as a major treatment option should be used. At the same time, local massage for Client B on Wednesday would target somatic structures affected by both the weight training for the torso on the same day and Pilates from the day before. Clearly, you would focus on the mid-section of the body, the abdominal and lower back areas. Essentially, you would ensure that the normal resting muscle tone would be maintained in both superficially located muscles (e.g., lumbar erectors) and core muscles (e.g., quadratus lumborum muscle, iliopsoas muscle and abdominal muscles). Once again, you would spend at least 50% on kneading techniques, while incorporating postisometric relaxation (PIR) stretching technique for the harder-to-reach muscles. Thus, for those practitioners who would like to expand their practice into sports massage, I would like to emphasize that it is simpler and more rewarding to start working with fitness enthusiasts first and later move into the field of professional sports.